The journey through Ontario that started more than a week ago with Mike Richards in the westernmost part of the province ended Sunday with former Los Angeles Kings player and current team scout Alyn McCauley. Following two days in London with Drew Doughty and Jeff Carter, the Stanley Cup swung over to Eastern Ontario on Saturday for a day with Brad Richardson in Belleville. The following day in Gananoque with McCauley marked the end of a nine-day journey through the province for the Cup in which it was hosted by seven players before joining the Kings' scout. 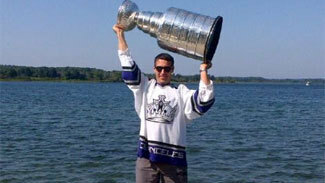 Kings scout Alyn McCauley enjoyed some time by the St. Lawrence River as the Stanley Cup arrived in his hometown of Gananoque. Saturday, Richardson received the Cup in his hometown of Belleville, located about halfway between Toronto and Ottawa, where he paid a visit to the nearby National Air Force Museum of Canada. The Cup was on display for about two hours at the museum, which also happened to be celebrating "Stone Dedication Day." The museum includes a designated area where about 9,000 memorial stones lay to commemorate a variety of people associated with the Canadian Air Force. On the day Richardson stopped by with the Cup, the museum happened to be adding 25 new stones to its collection. From the museum, Richardson brought the Cup to a series of events, including a visit to Belleville City Hall, which last saw the Cup in 2009 when Matt Cooke brought it to town following his championship with the Pittsburgh Penguins. After a celebration with friends and family, including a ball hockey game in which Richardson played between the pipes, the Cup was chaperoned 65 miles east Sunday to Gananoque. Located near the New York border, Gananoque already had a big summer planned, as 2012 marked the 200th anniversary of the historic town's vital role in the War of 1812. In fact, the town already had a historical reenactment of the Attack on Gananoque scheduled for Sunday, but the Cup's arrival made the day even more special for local residents. For McCauley, who played 10 seasons in the NHL, the day with the Cup started among friends and family at his home before attending a public appearance at his old grammar school. The day ended with a celebration among family and friends, including Brett Gibson, head hockey coach at Queens University. McCauley worked as an assistant coach at the school, joining the staff in 2008 after the departure of Kirk Muller, who now serves as coach of the Carolina Hurricanes. After more than a week roaming through Ontario, the Cup will arrive in Minneapolis on Monday to spend the day with Kings defenseman Davis Drewiske.